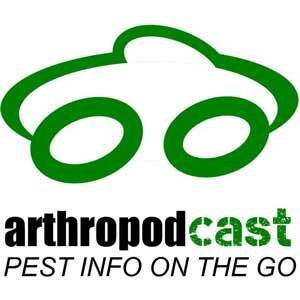 Arthropodcast, an online podcast providing “pest info on the go,” reached its 10,000th download March 14 during its 50th episode. Steve Jackson and Bryan Baird, friends who have worked in the pest management industry together for several years, became inspired to start Arthropodcast while talking on the phone as they traveled to and from inspections. “I was thinking to myself, if we would just record these phone conversations someone would find it entertaining,” Jackson recalls. Together, co-hosts Jackson and Baird have more than 30 years of industry experience. From working as technicians to starting their own businesses, they have acquired a unique perspective of every level in the industry and apply their knowledge in all of their 30-minute weekly podcasts. The duo hope to support others in pest control by making them laugh and allowing them to take away useful information that they can relate to and implement in their own lives. “I like knowing that we can do something that will entertain somebody or give them a tip that helps them with a particular problem,” says Jackson. Now only a year since their podcast began, they have already reached their 10,000th download. “It’s exciting, knowing we hit the 50-episode milestone is a good feeling,” Jackson says. 2 Comments on "Industry podcast reaches 10,000 downloads during 50th episode"
Thanks James! You’ve played a big role in it’s success.